I am a sole trader needing occasional support – would you still offer the same level of service to me? Yes. Whether you send us 2 calls or 2000 calls, it makes no difference to our level of service. My business services are quite involved – would your team be able to manage detailed enquiries? Yes. We work with you to build your protocol, and to ensure our operators are well trained in your services. My business offers many different products, would your team be capable of handling my customer enquiries? Absolutely, we build your products into our system, import all of the information directly, and our staff then work with you to ensure we understand your product offerings comprehensively. We want to offer an instant live online help desk to our customers – are you able to help? What do you do if a customer needs urgent assistance, or if the phone call/email is high priority? Depending on your protocol, we may transfer to the on-call person, we may send an immediate text with an expected confirmation reply, or we may flag urgent emails – we simply follow the protocol we have created with you for that situation. Do I need to alert you whenever I want to forward calls from my business? No. You can forward calls whenever you like and we will follow the protocols that are in place. 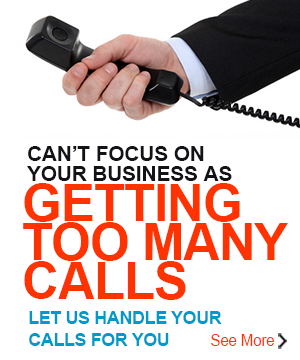 Our business handles over 1000 calls a month – are you able to handle high frequency traffic? Will my customer’s calls ever enter call-queuing? No. Your customer’s calls will never enter a call queue, all of your customers calls are in a constant ‘live call’ status. How do you interface with my company database, and is it safe? We work with any product, any database, depending on what’s required. It may be web-based, it may be a link via Citrix for example, but we always use strict privacy guidelines and security guidelines. All of our employees sign a confidentiality agreement. I am worried about both my clients’ and my business’ privacy – are our details safe with you? Yes, absolutely. We take our client’s privacy very seriously, and have robust confidentiality agreements for all of our employees.